Sleeping on a mat in a bedouin tent was not the worst night of sleep I’ve had in the past year. 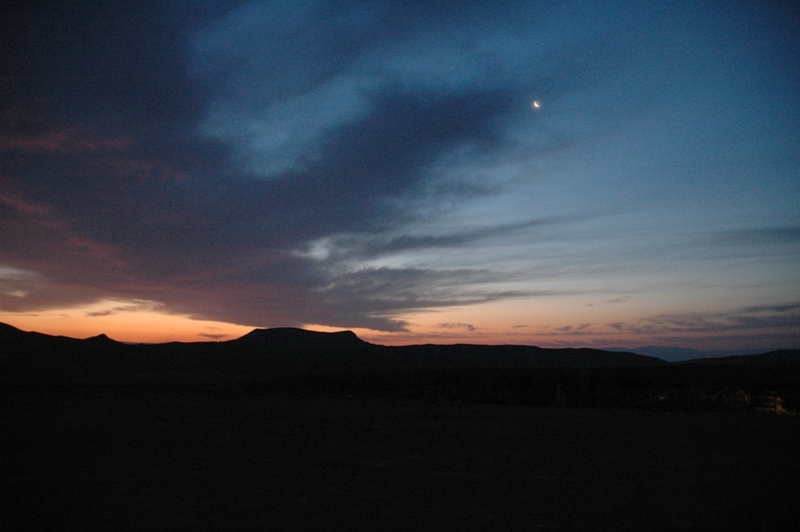 But most of us were up early and ready to watch the sunrise chase the crescent moon over the eastern horizon. 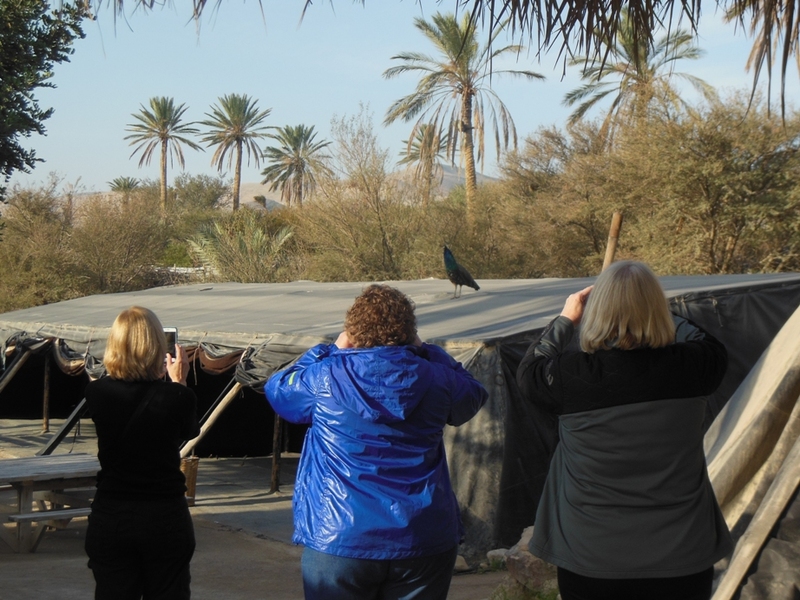 We enjoyed a hearty breakfast and a few final features of the oasis. 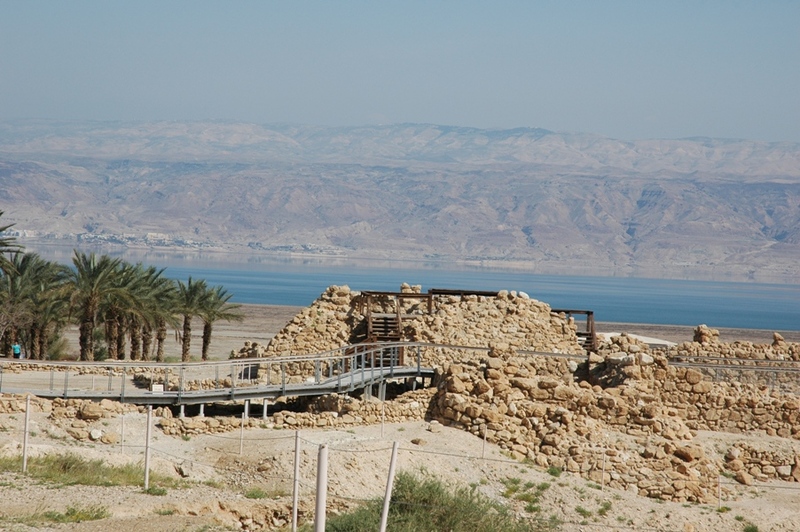 Just five miles down the road we found ourselves at Masada, Herod’s fortress palace overlooking the Dead Sea. This was my first time entering from the west, up the side of the Roman ramp constructed in 73 AD by Roman soldiers and Jewish slaves in an attempt to dislodge the 900 Jewish zealots who had taken over the fortress. Looking back over our shoulders as we ascended alongside the ramp, we could see the spring greenery blooming on adjacent hillsides, a condition that lasts just a few short weeks in Israel. 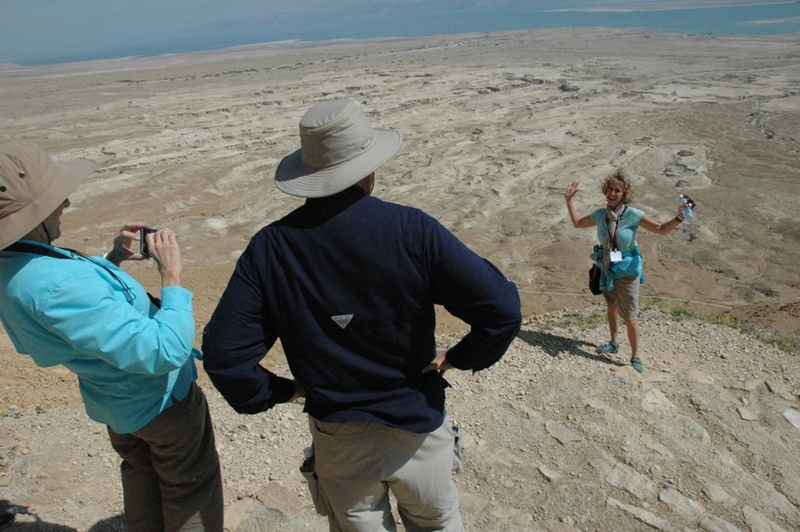 Soon we were on top of Masada, overlooking Dead Sea. To have a palace on top of a mountain in the desert, there needs to be lots of cisterns, to hold the water from the rare desert rainstorms. 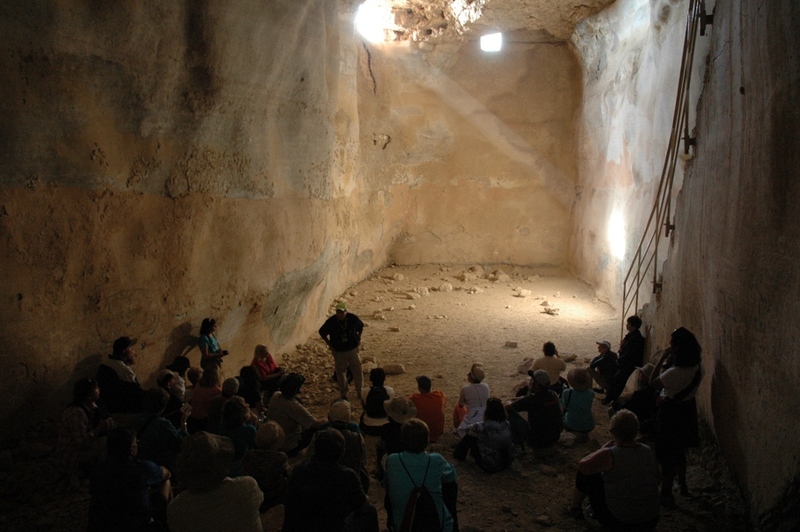 Our guide Shlomo began to tell us the story of Masada in a theater-sized cistern. 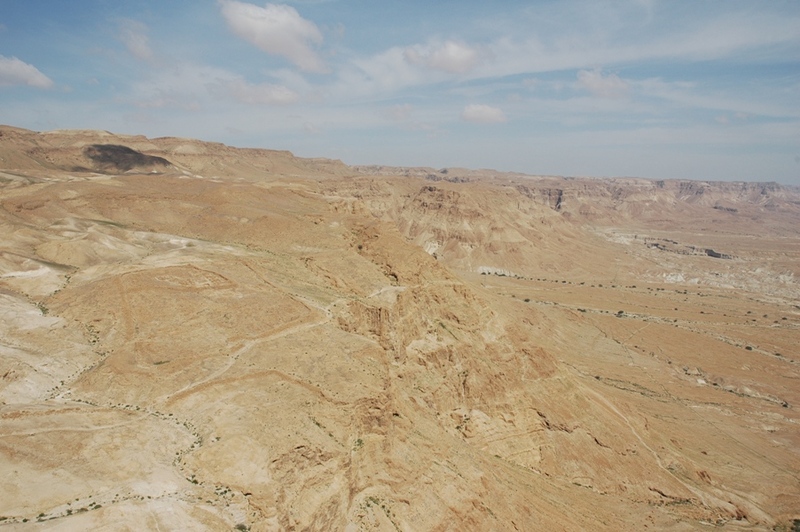 The views from Masada are incredible. 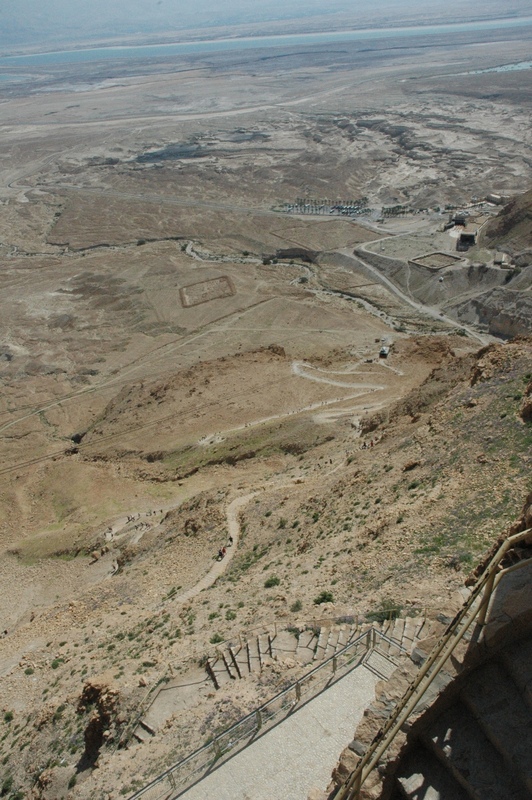 From this side of Masada you can see the 2,000-year old remains of one of the Roman’s military camps (center left) and siege wall, as well as the trail that heads north to the Ein Gedi oasis (in the upper right corner). 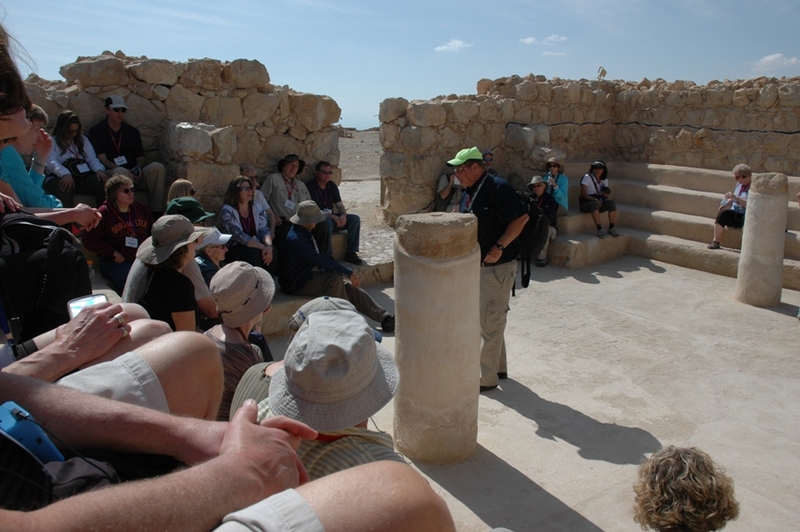 In the Masada synagogue, Shlomo concluded the story of the zealots of 73 AD who took their own lives just before the Roman soldiers breached the fortress. In the vicinity of this synagogue, archaeologists found eleven ostraca (potsherds), each with a name written on it. It’s believed these were the lots cast by the men to decide who would kill others and then themselves. 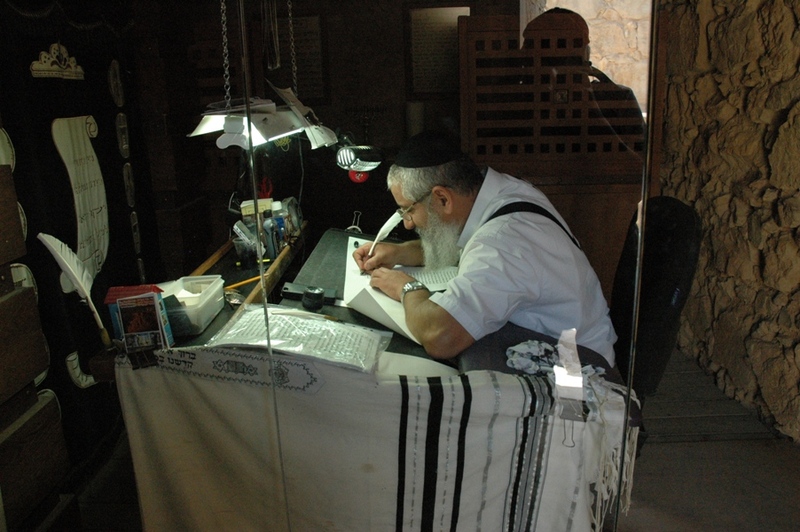 In a small room next to the synagogue at Masada a scribe patiently follows ancient traditions to create a new text of the Torah. When it was time to leave, some of our group chose not to take the cable car. 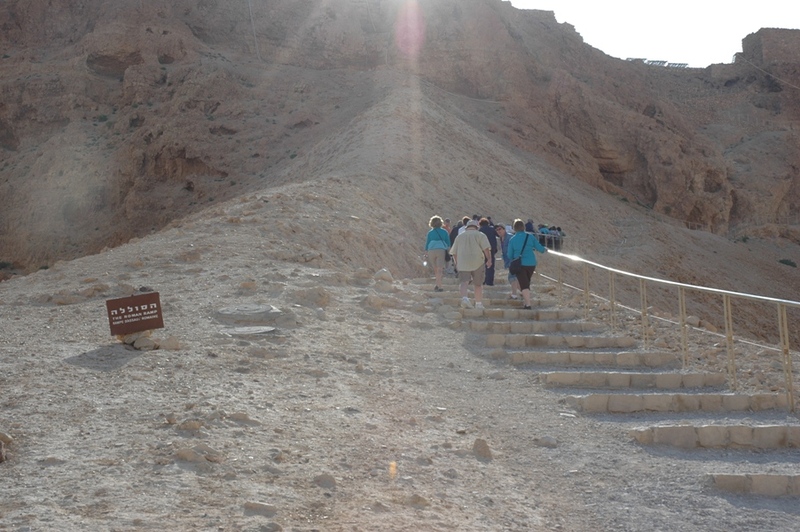 Instead we walked down the Masada snake path. The outline of three more Roman camps can be seen at the end of the path. We enjoyed numerous photo ops on the descending snake path. 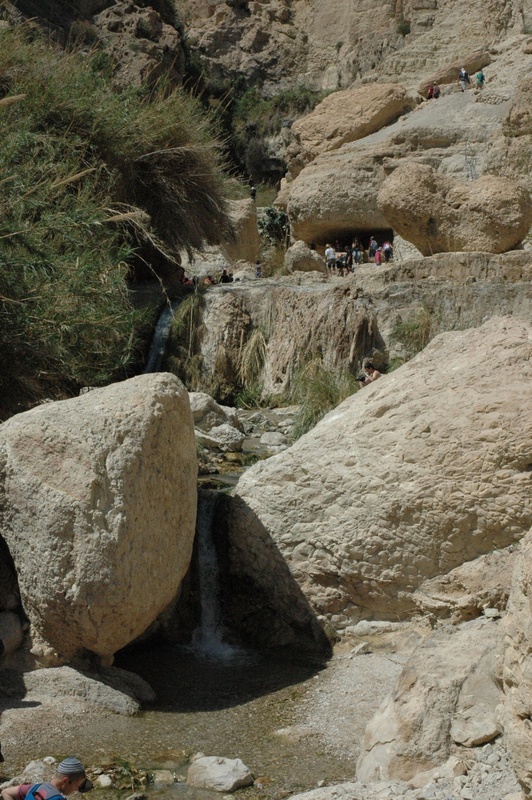 Just north of Masada is the nearest water source, the oasis of Ein Gedi: tropical greenery between the desert and the Dead Sea. 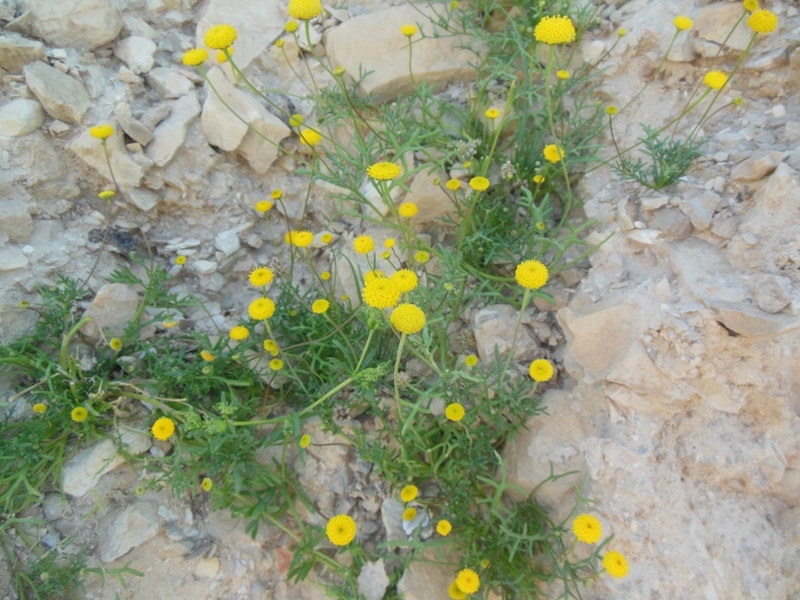 We read from 1st Samuel (as well as from Songs of Songs 1 and 2nd Chronicles 20) about David’s and Saul’s encounters in this area. 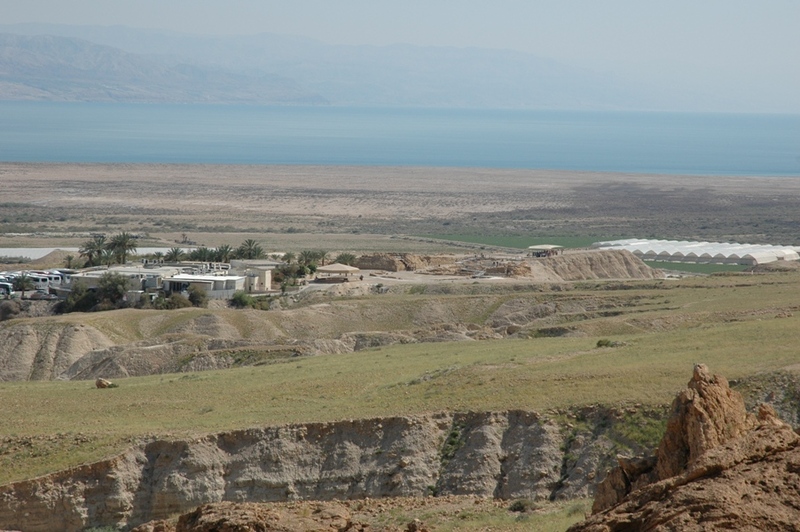 Along the northeastern shore of the Dead Sea, the ancient site of Khirbet Qumran, where the Dead Sea scrolls were found. 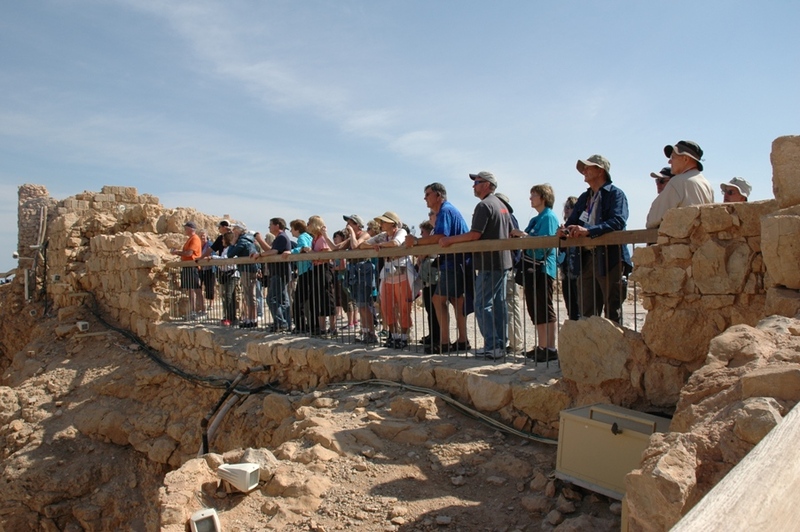 In the middle of the Qumran ruins, the defensive tower constructed by the earliest inhabitants. 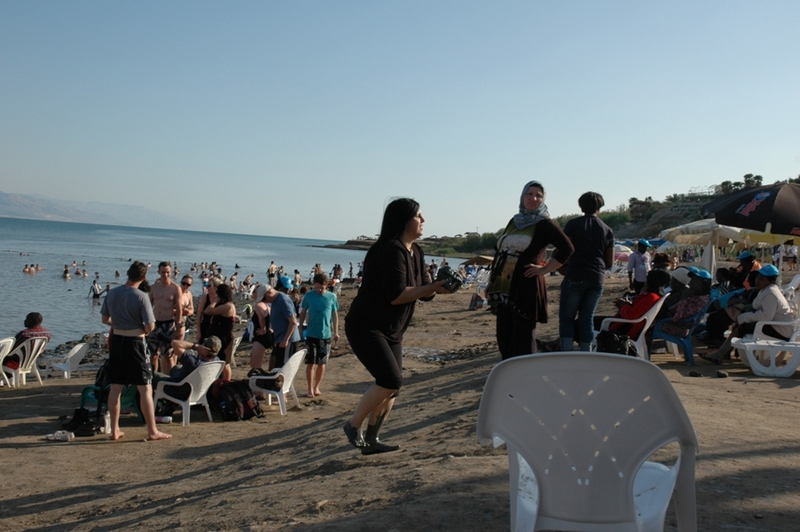 Of course almost everybody wanted to “swim” in the Dead Sea, which is actually floating, because of the 30-33% mineral content. 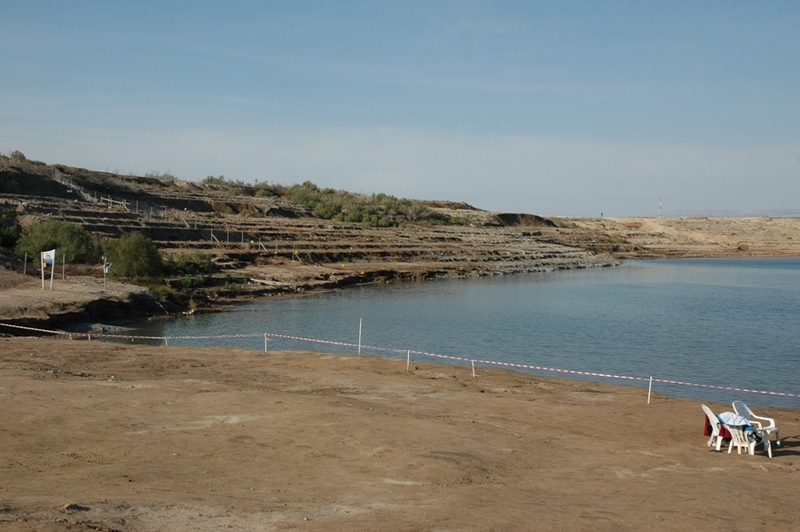 Next to our Dead Sea beach, the shore showed how the Dead Sea has been dropping precipitously in recent years. 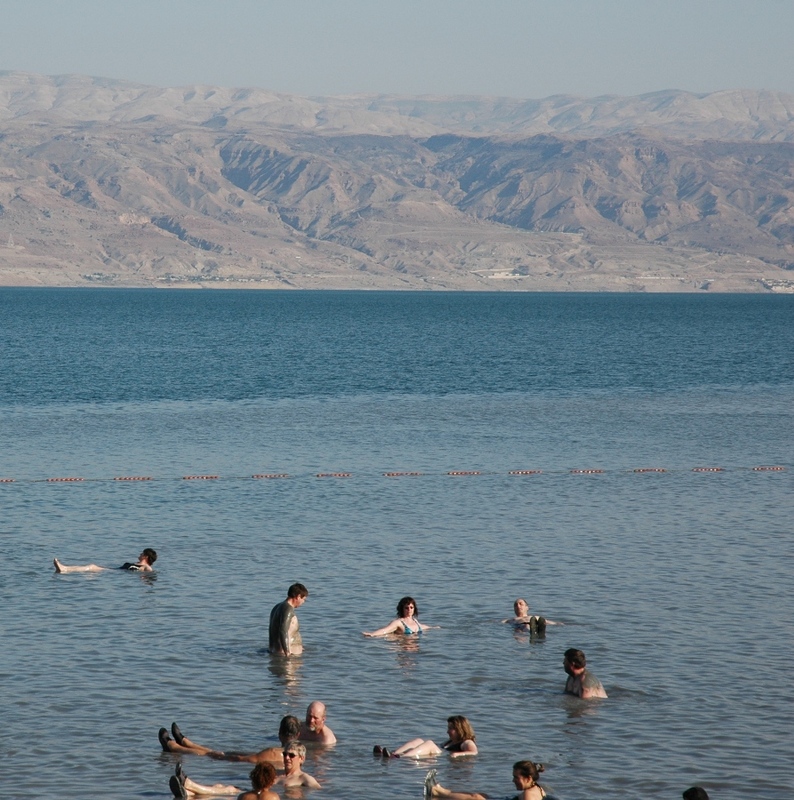 People come to the Dead Sea for floating, and also for the mineral mud, which is a great skin treatment. From our beach location it was easy to see Mt. 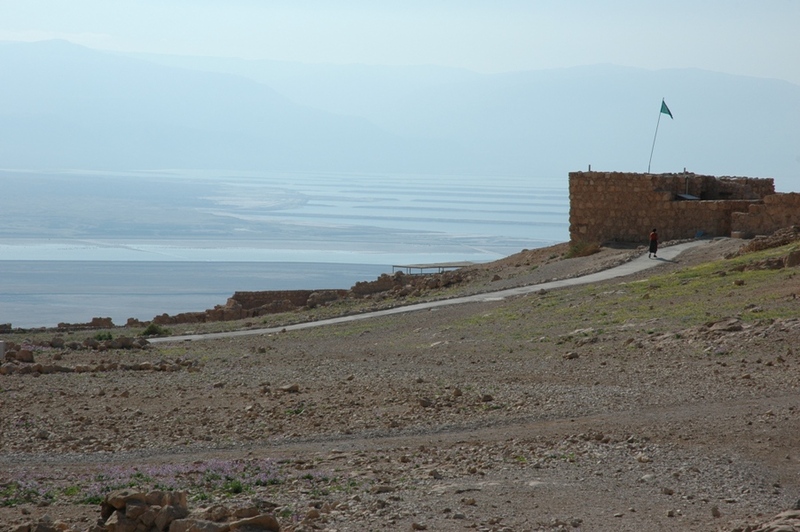 Nebo, in Jordan, where Moses looked over the Promised Land (white building on top of the ridgeline, upper left corner). When the skies are this unusually clear, it’s supposed to be possible to see Jerusalem from Mt. Nebo. 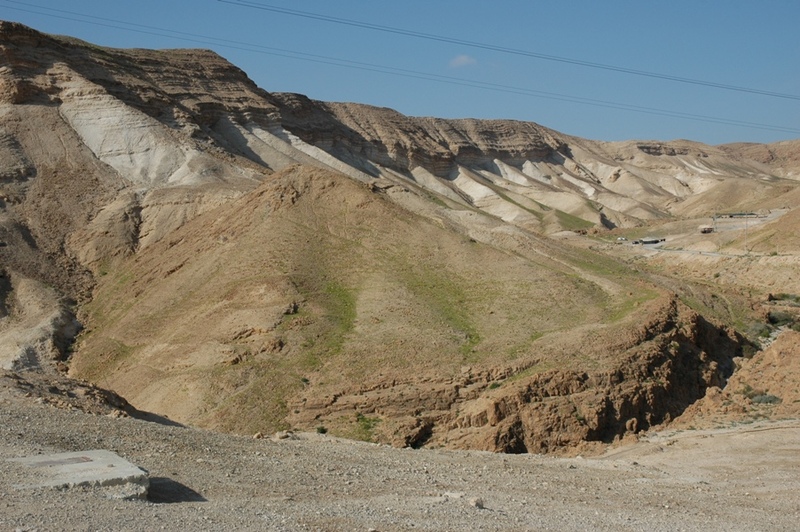 In Jericho, which claims to be 10,000 years old–the oldest city in the world, archaeologists have excavated the walls which some believe are the walls destroyed by Joshua and the Israelites. 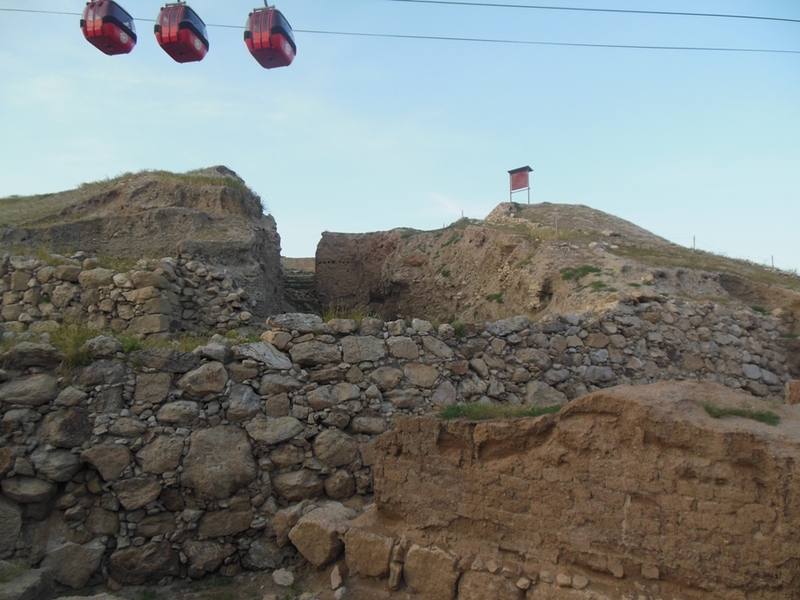 The cable car above takes passengers up to the Mount of Temptation. The sun went down as we drove north along the Jordan River. 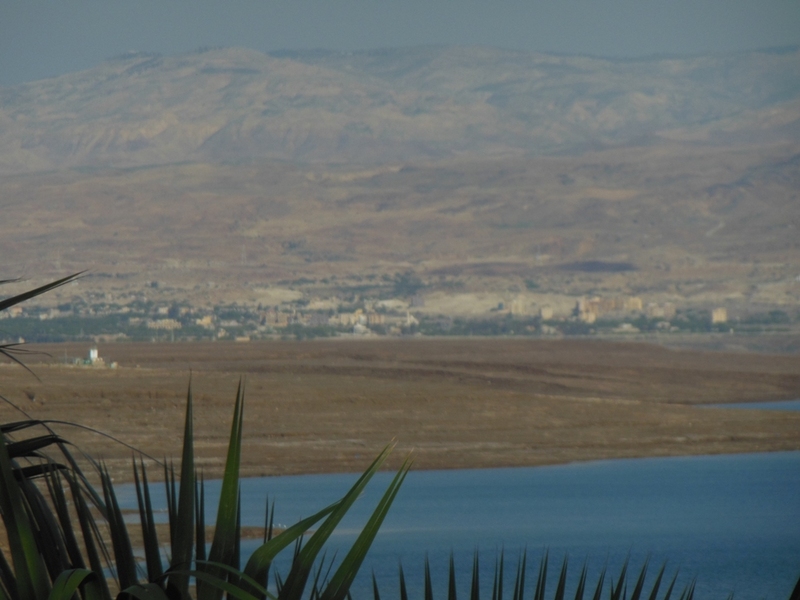 When we arrived at our home for the next three days, kibbutz Ginnosar, we walked out to see the Sea of Galilee before we retired for the night. 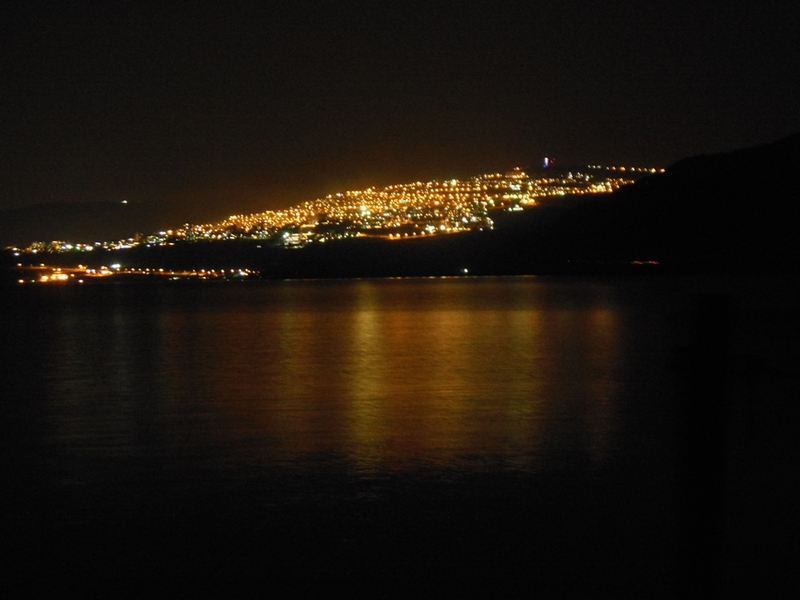 Just to the south of us we saw the lights of Tiberias, a city on a hill, reflected in the Galilee waters.